In Major Events sponsorship, it is common for companies to make “payment” in the form of products and services in return for the use of event marketing rights and benefits. In Technology sponsorships, this Value-in-Kind (VIK) may represent more than 50% of the total technology budget of the event. Making VIK work for both sponsors and event organisers requires a careful balancing of value so that both parties get what they need from the deal. The exchange of products and services in return for marketing rights is a form of barter. Sponsors give something they have (their products and services) and the event organisers give the sponsors something in return (marketing rights and benefits). The Value-in-Kind could be something as simple (yet critical) as coffee or as complex as timing & scoring systems. Event organisers want to obtain the products and services they need to run the event free of charge (or with minimal cost) as budget relief. Increasingly, innovation capability is becoming an essential need as organisers look to make their event unique and compelling. Event organisers also need the help of sponsors to promote the event both locally and globally, attracting more awareness and digital engagement, in the hope that this will drive increased attendance and ticket sales. Primarily sponsors want their association with the event to raise their profile, which in turn will generate more business. This may be focused on a specific product or service within the portfolio, or more broadly across the entire company brand. 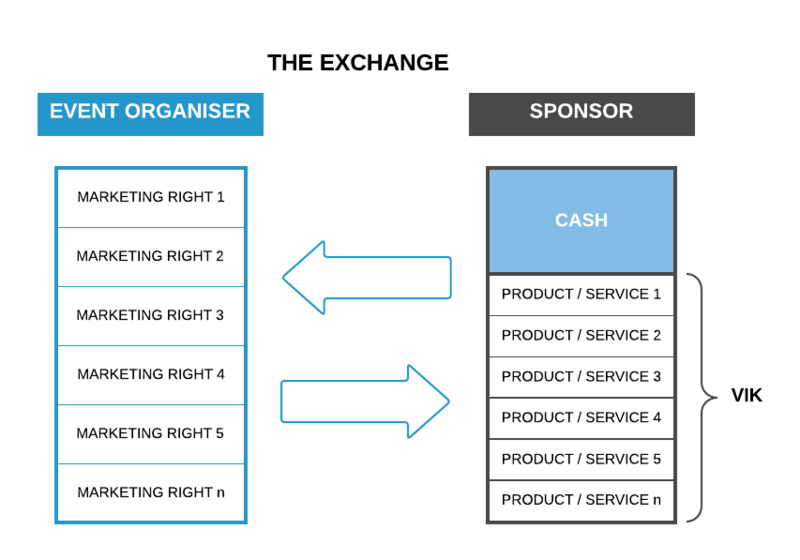 Sometimes sponsors want their business case to work within the direct perimeter and timescale of the event, but this tends to be an unrealistic expectation as the intangible benefits of brand awareness and reputation can be incredibly challenging to justify. Unfortunately, barter has never been an effective form of payment, as it restricts the ability of both parties to act freely in the market and extract the greatest value. Event organizers need to assess the value of the proposed products and services, and the sponsors need to assess the value of the offered marketing rights. In the competitive market, products and services are subject to discounts and negotiation, while for event sponsorship this is less often the case. They may be offered at list price (or higher), as this will result in a higher corresponding value of the marketing rights. It is even harder for potential sponsors to value the event marketing rights and benefits. The result is a lot of time and effort on both sides to value the deal. This is equivalent to two RFPs being run in parallel, one for products & services and the other for marketing rights, where the values must eventually be equal. The pool of major events and sponsors is small. Events need to find companies and organizations that want to associate their brand with the event. Companies need to find events that want the products and services that they offer. This coincidence of wants is the primary reason we use cash in daily life instead of barter. Our research shows that greater than 80% of the Digital Impact of a Major Event is realized within the period from one week prior, to one week after the event. That makes sense because for the rest of the year other events are competing for the limelight. But many of the costs that VIK covers are incurred in the preparation of the event, so sponsors are providing products and services many months or even years before they get paid in marketing rights. When is VIK is a good thing? Despite the challenges described above, Value-in-Kind is the driving force which delivers value to both major event organizers and sponsors. It is much easier to find companies that want to provide their products and services for free (or greatly discounted) than companies who would pay cash for marketing rights. “Crufts uses our dogfood” is a story the sponsor can tell their customers and their employees. From a valuation perspective, $100 worth of sponsor product or service may cost the company only a fraction of this to deliver. Win-Win. From a delivery perspective, when companies propose their own products and services for an event, they put their brand on the line. They go beyond standard Service Level Agreements and contract terms to ensure that their brand is not negatively impacted and hence contribute to making the event a success. Finally, VIK enables both organizers and sponsors to deliver the X-Factor: unique products, services, and experiences that can be jointly promoted. When is VIK not a good thing? It seems obvious that there is no point getting free stuff if you don’t need it, but this scenario is far too common in the VIK world. Most often it’s because the event organizer doesn’t yet know exactly what they need, and the potential sponsor pushes what they have, whether it’s needed or not. Not only does it result in unrealized value, but it also creates an overhead to manage. One way around this is for event organizers to know what they want before engaging a sponsor. Seems simple enough, but never underestimate the power of sales. 2. Is it the right product or service? Not all products and services are equal. This applies to all categories. With the wrong solution to your problem, you will be in the situation with either dissatisfied end users or the need to spend cash in the market to procure the right solution. 3. Is it market price? VIK is a necessary part of Major Events. In Milan Expo 2015 for example, sponsorship represented around 30% of revenue, with VIK representing almost 80% of those sponsorships. Other events, with less ticketing revenue depend even more on sponsorship. In the area of Technology and Digital Services, the delivery component is both complex and essential. Major Events provide technology sponsors with an amazing platform to tell their story to the world and to convince customers of their capabilities. Event Organisers need to know what they need as much as possible and then find sponsors which fit those needs. There will be some uncertainties and the right partners will need to adapt to the needs of the event. A competitive bidding process works best to assess the value and ensure that the products and services chosen are the right ones. While this seems obvious, an unsolicited offer to Event Organisers looking for sponsorship can be very appealing. Use the sponsor brand exposure to ensure delivery performance. Financial penalties for delay and poor quality products and service are less useful than the threat of negative brand reputation for the sponsor. Look for the X-Factor – it’s not all about providing the basics. You want your event to be unique, innovative and compelling. Find partners who can contribute to that goal. Be original. Sponsors often want to paint their brand with the latest trend or buzzword. Find the right match of sponsor capabilities with the event brand and avoid playing buzzword bingo. Alkira was created to help organizations design and deliver critical technology projects. We provide design, project management & integration expertise for complex and business critical projects and programmes.